Genuine reductions on clearance items - for a limited time only. Click above to see the deals on offer. Once they're gone, they're gone! The top part of this page explains how to size your caravan for a full awning. Click here to jump to how to size your caravan for a porch awning. Q1/ What size of Awning do I need to fit my caravan? A1/ The size of awning needed to fit any particular caravan depends on the measurement in centimeters from the ground around the awning rail and back to the ground. This can easily be measured as per the simple diagram below. 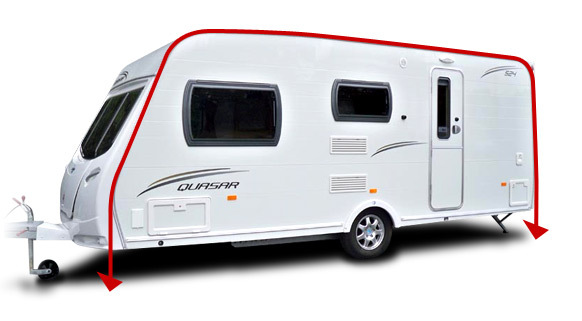 In recent years caravan manufacturers have mostly made life a little easier for us and they quote the ground to ground measurement in their brochures or on their web sites. If you still have problems working it out, e-mail us with the year, make and model of caravan concerned we may be able to look this up for you. Each awning manufacturer has their own way of converting this ground to ground measurement into an awning size but this is how it works for the 3 major manufacturers that we stock. Click here to see all the full awnings we sell (opens in a new window so you can still see the table below for sizing). Q2/ Will a porch awning fit my caravan? A2/ There are two facts that you need to be sure that any specific porch will fit any specific caravan. Firstly the height from the ground (H) to the awning rail (not the overall height of the caravan as this will include the roof-light and TV aerial) and secondly that the caravan is long enough (L) to accommodate the length of the awning where the roof is relatively flat. Provided these two points are met the porch will fit your caravan. It is sometimes advisable to check on your caravan where the porch will fit and see if the sides might interfere with any windows, doors, hatches etc that you might want to have open when the porch is erected. H - Height of awning rail from ground. X2 - Caravan door will open into side of porch. Click here to see all the Porch awnings we sell (opens in a new window so you can still refer to this page).